Recently I wrote to you telling about the article our friends at Haven in Paris shared on their HiP Paris blog. 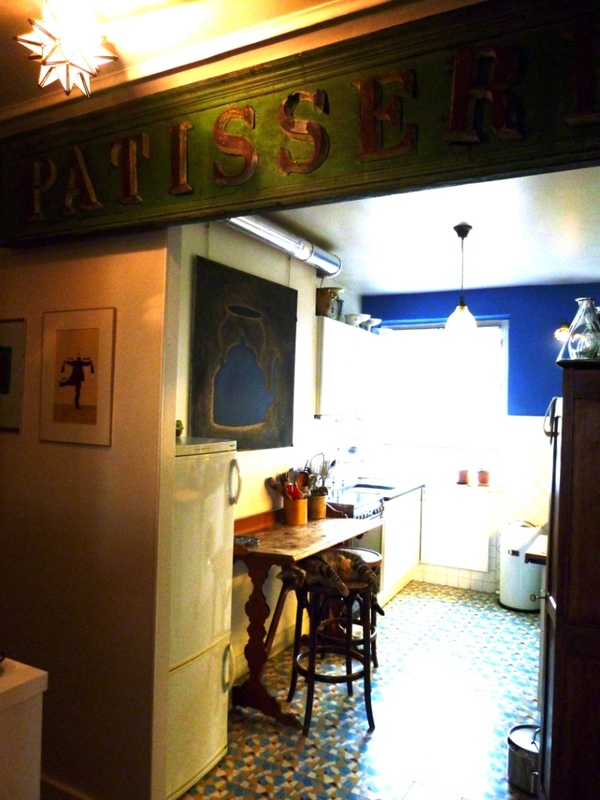 This week I want to share with you an inside glimpse at the fun & funky Parisian apartment of Haven in Paris owner Erica B. Earlier this year Erica and I had a chance to meet in person and I was absolutely smitten with not only Erica but the view from her Montmartre pied-a-terre as well as her divine French kitchen décor! Above the door to Erica’s quirky kitchen hangs a giant Patisserie sign purchased at one of my favorite flea markets in the south of France. Erica happens to be a flea market maven and one day while shopping in Ville Neuve Les Avignons she honed in on the biggest bargain at the market. This sign was going for a song and knowing she had a good deal on her hands she snagged this sign and before she left the market other vendors were coming up and trying to buy it off of her! Erica happily showed me around her apartment and in getting to know her and seeing her fun French style of décor I could understand why her company – Haven in Paris – has become so popular. 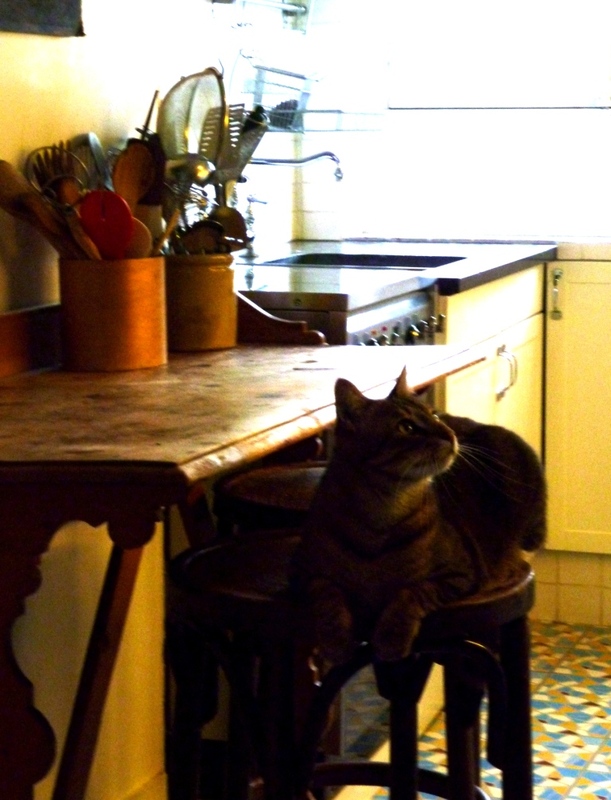 She chooses apartments with personality – that show the French joie de vivre and style of décor. Her commitment to excellence in quality guarantees the apartments in her selection are top quality. Plus – you may not know this – but when Erica is at her other home in Italy she rents out her Bourgeois Bohemian partment as part of the Haven in Paris line up of sensational places to stay in Paris. 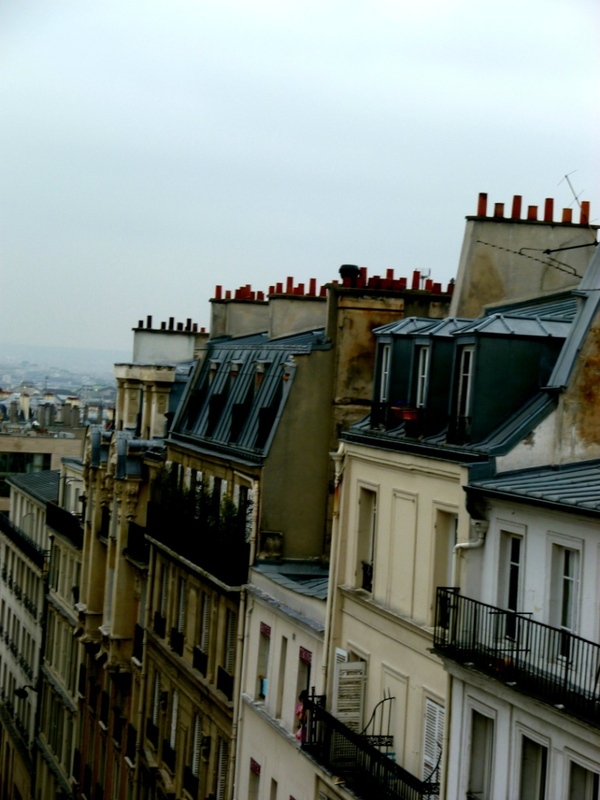 Make sure to visit Erica’s blog – HiP Paris – and check out Haven in Paris apartment rentals on your next stay in the city of light (or in her other locales in Tuscany and Provence). I do consider all the concepts you have introduced on your post. They are really convincing and will certainly work. Nonetheless, the posts are very quick for beginners. May you please prolong them a bit from next time? Thanks for the post. Wow….Thats impressive such a informative article with nice pictures. good explanation. thanks for it. Jessica Thornton – Mindy Thank you so much for taking the time out of your very busy shclduee to take photos of my nieces during their visit. You have such a talent and these photos are something my whole family will treasure for a long time. Just looking at them on your blog makes me smile! Thanks again, so much! J.
Parisien Salon – Agreed! I would do the same!!! Carina, I fear if that sign ever gets stolen I”ll be the first person she’ll blame!!! I’m a big fan of Erica’s Houdon apartment, having visited there many, many times (and stayed a few). I have considering not just grabbing that sign and trying to make a clean getaway, but several other flea market finds in her apartment.